The Florida Highway Patrol is investigating a fatal crash involving a school bus and a motorcycle. ST. PETERSBURG, Fla. — The Florida Highway Patrol is investigating a fatal crash involving a school bus and a motorcycle. FHP responded to the intersection of 62nd Avenue North and 28th Street North in St. Petersburg just before 5 p.m. Tuesday. No injuries have been reported to any children aboard the bus, according to FHP. The school bus involved was transporting four students who attend Nina Harris School, a school for students with special needs located in Pinellas Park. 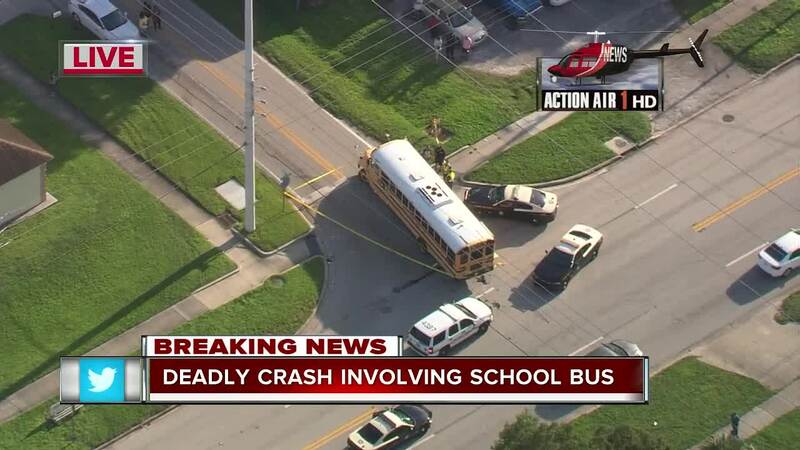 "None of the students or Pinellas County Schools staff on board the bus were injured. Parents have chosen to pick up their students, but an alternative school bus was also available to transport them home. Support services will be available to the students and staff who witnessed the accident, if needed," the Pinellas County School District said in a statement. According to FHP, the motorcyclist, Wanderley Echemen, 21, was traveling east down 62nd Avenue North when the school bus took a left turn, into the motorcyclist's path. As a result, the front of the school bus struck the right side of the motorcycle, according to FHP. Echemen was pronounced dead at the scene. FHP says that charges are pending against the bus driver.